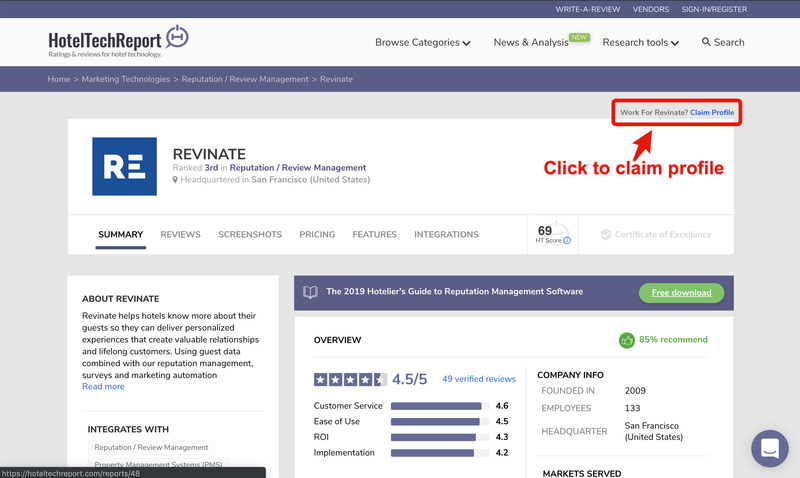 Claim your company's listings on Hotel Tech Report in 3 easy steps. New product profiles will be spun up within 48-hours of completing the new product registration form and you will receive a notification email. Once they are live, head to any of your company's profiles and press the 'claim profile' button shown below. Want to claim multiple product profiles for your company? If your company has multiple product profiles (or you would like to create and claim multiple profiles) claim one profile first. Then, after you receive access to that profile, we will reach out with information about gaining access to your additional product profiles.